You guys know that I love to bake, but there is no better time for it than during the last three months of the year. There's Halloween, Bonfire Night, Christmas and Thanksgiving for our pals across the pond, and all of these occasions just beg to have something baked to commemorate them. But we're not thinking about November and December yet - it's all about October and spooky season! 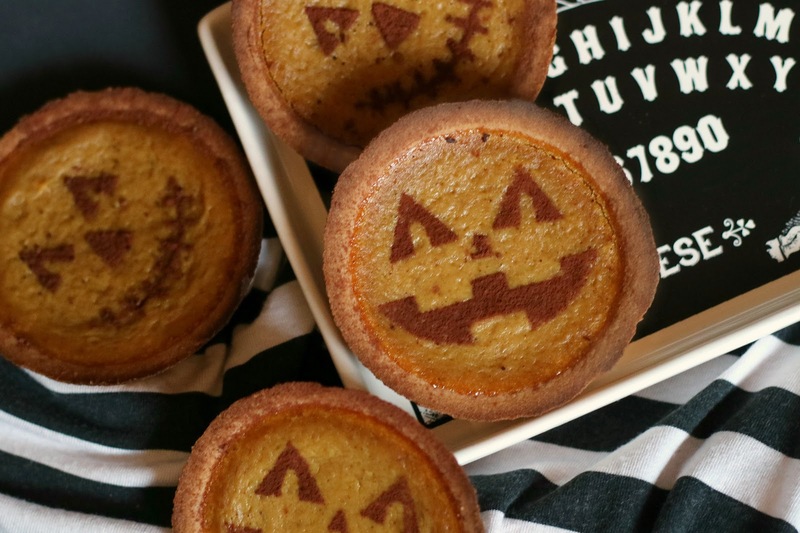 Every year, I love to cram in as many Halloween recipes on to my blog as I can, and I'll admit, I've been a bit rubbish with planning what I want to do this time around because of Masters stress, but I've got some tricks up my sleeve! 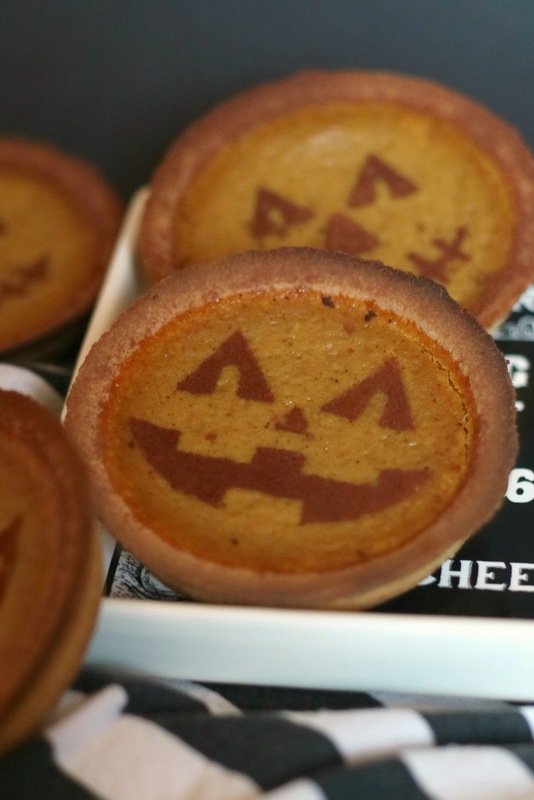 So to kick off my Halloween baking, I've got a super simple recipe to share for these adorable mini pumpkin tarts. As soon as all the pumpkins come out, you know it's autumn. Everything about them just screams the season - the colour, the flavour, the scent... everything! And of course, they're a Halloween icon. Unpopular opinion: I love Halloween but I hate carving pumpkins with a passion. It's so cute to see all the pumpkins lit up outside people's houses, but the actual process of getting them to look that good is such a hassle. I'll skip the hand cramp and just look at everyone else's handiwork. I thought I'd managed to avoid carving pumpkins this year, but that was until I ventured to the supermarket to find some pumpkin puree. Lo and behold, there wasn't a single can anywhere, so I had to buy a whole pumpkin and make my own puree. While this wouldn't be an issue with any other fruit or veg, pumpkins are notoriously difficult to cut up. Of course, it added to the whole homemade side of things, but oh man, my bingo wings were feeling it! If you can't find any puree or want to try making your own, here is a great recipe for it. While it was all well and good making pumpkin tarts, I really wanted to put a proper Halloween spin on these little guys. They needed to be just a tiny bit spooky and really indicate that they were pumpkin-y. I managed to find these Halloween coffee stencils on eBay with two pumpkin faces, so I had to grab them! 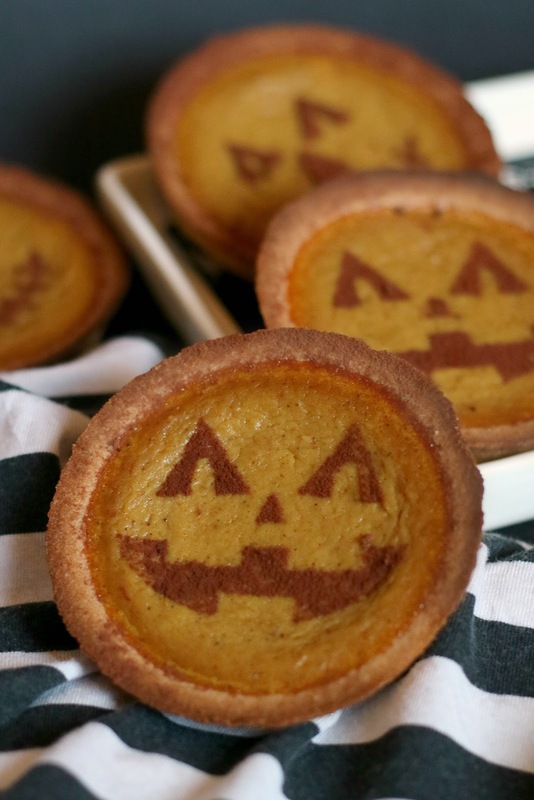 Not only are these ideal for adding a creepy twist to your morning coffee, but they're also perfect for achieving the look of a carved pumpkin on top of these tarts. Preheat your oven to 200c (180c fan). In a medium-sized mixing bowl, whisk together the brown sugar, cinnamon, ginger, nutmeg, cloves, and salt until well combined. Then whisk in the pumpkin puree, evaporated milk, and egg until fully combined. Place your tart cases on to a baking tray and fill each one with the pumpkin mixture, making sure to leave a small amount of space at the top. Pop them into the oven and bake for around 20 minutes or until the tops of the tarts look set. Remove them from the oven and place them on a wire rack to cool for about an hour. Place a coffee stencil on top of a cooled tart and sieve cocoa powder gently above it. Remove the coffee stencil carefully to reveal your pumpkin face. Repeat this step with each tart, then place them in the fridge for a couple of hours. These little tarts are ridiculously easy to make and ideal if you're looking for something a bit more grown up to make this season. Cupcakes and brownies are all well and good, but imagine serving up one of these on a Halloween afternoon tea! If wrapped up tightly and refrigerated, these mini tarts should keep for 3 days. Stay tuned to see my upcoming Halloween bakes!